HIGH NOTE: The talented British crooner gives us something to sing about. 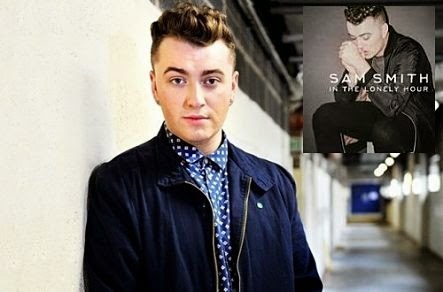 Let's just get this out of the way: Sam Smith is, without doubt, the male version of Adele. Given the striking parallels in their work and origin stories, there is no other way to put it. Extravagantly gifted as songwriters and vocalists, they both exude a very exquisite (and very British) kind of artistic brilliance, which effortlessly comes across in their music, equal parts soulful and angsty, enlightening and evocative. At the same time, they chart similar territory when it comes to the themes they choose to explore in song ― passion, pleasure, life's bittersweet moments, lovers done wrong ― and their legions of fans can't get enough. That's why they've sold millions of records and their names are on everyone's lips. Did I neglect to mention that they're also a hit with Grammy voters? While Adele scooped up two trophies for her astonishing debut 19 and six for 21 (her sophomore release), Smith's In The Lonely Hour has racked up six nominations for next months awards, specifically bids for Best New Artist, Pop Vocal Album, Pop Solo Performance, Record, Song and Album of the Year. Listening to the songs on the album, it isn't hard to see why. Unless you've been living under a rock for the past year of so, you've heard "Stay With Me," Smith's haunting petition to an indifferent lover that has spawned countless cover versions. Then there's "I'm Not The Only One," a sublime jewel all the more noteworthy for its sincerity and slow-burning sensibilities. And you can't deny the between-the-sheets appeal of a track like "Leave Your Lover," which, thanks to its sly and subtle innuendoes, wouldn't be out of place on an album by, say, James Blunt of Michael Bublé. In The Lonely Hour is a record of iPod-worthy highlights that draw attention to Smith's knack for bringing together the key ingredients that make up a successful tune: meaningful words, unforgettable melodies and the vocal talent to guarantee a pleasurable listening experience. In the end, the album is a seductive and satisfying effort, in spite of its brisk 40-minute running time. Whether you're vibing to the playful, moody "Money On My Mind" or entranced by the evocative, vivid "Lay Me Down", Sam Smith never fails to connect with you on some level. > BEST TRACKS: "I'm Not the Only One," "Life Support," "Good Thing" and "Stay With Me"